Hoping for some help. I have a Brother machine (which I Love!) and am using the 1/4" pressure foot with guide. For some reason, the left side of the foot catches the seam allowance and hangs up. It looks like this is the only design for this type of foot...what am I doing wrong? If this post doesn't make sense, I can add a picture of what's happening. Thanks! Look for a rough spot or a burr on the foot. I have the same foot, and it doesn't catch anything. If you're sewing strips, there should be nothing but fabric under the left side of your foot..not a seam..I'm not sure that I get where the problem is? I think Donna13350 is correct. There is another foot that doesn't have the fabric guide, but using it would probably not make a difference with the problem you describe. I'm with Donna. I don't know what would be catching unless there is a rough spot on the foot. All the should be under that part of the foot is a couple layers of fabric. I have the same foot and have not had this problem. Could you put some tape under the foot to help it "slide"? I've actually given up on this foot because I think it's a little crooked. I use the 1/4" setting on my machine and use the regular foot. I have that same foot and have the same problem when sewing over a seam. 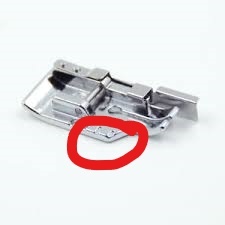 I have not been able to correct the problem so slow down and use a stilleto when I get to the seam. I love my Brother sewing machine too, so just put up with the problem. Sorry I don’t have a solution for you. I have had the same problem with this foot on my Brother. It catches any seam intersections. I gave up and am using a generic clear plastic 1/4 in foot on it. Much better. Thanks, Rainbow Zebra & Pam S...glad to know it's not just me! You would think Brother would do a re-design??? I'm just not confident enough to do away with the 1/4" guide yet. There are other types of 1/4" guides that you can use. I did have a thought. Does your machine have a pressure adjustment for the presser foot? Lightening up the pressure on the foot might help it to not drag as much when crossing seams. I took the guide off my foot like this. I like it better without the guide. I"m not sure Brother actually makes this foot. I bought a generic 1/4 inch foot several years ago from Amazon and it looks just like the one you have. As a few others have commented, the 1/4 inch foot without the fabric guide seems to work better. I have that foot and don't like it. Mine turned up the seams too. I use the SA125 and am very happy with it. If my seam is too small, ie, not a full 1/4", it can grab the edges of the seam and get hung up on them. I mostly solved the problem with trying to always sew so that the seam is pointing towards me, making the problem go away. There are times, I have had to sew from one end, then turn the piece over and start where I had stopped on the other side and continue sewing to the edge. Or just sew right through that offending seam and then go back to the other side and continue sewing. Where there is a will, there is a way. I have this same problem when sewing over seams, especially if I happen to have a diagonal seam on the top that just couldn't go in the machine another way. When I am sewing and one of those pesky seams is approaching the foot, I lay a narrow (1/2 inch or so) strip of paper over the seam. The paper seems to stay put better than the seam allowance, and it's easy to pull off after you stitch over it. Too Much pressure holding the foot on the material maybe. When I have this issue (with any machine) I have often found it's the pressure. Loosen it up just a hair and see if that helps. I just bought a singer patchwork sewing machine in November. I was sewing last week with the 1/4 inch foot and all of a sudden it hit the middle bar of that foot, broke the needle and somehow broke the little hook off of the automatic needle threader. I am so disappointed because I was determined I was going to learn how to use the automatic threader and finally had accomplished it. I can still use the machine but I have to thread the machine by hand. here is a link to a new needle threader for your machine...but in the future make sure that the screw holding your foot on is tight..when it's loose, and the foot wobbles, that's when your needle hits it and you have problems. Last edited by donna13350; 02-17-2019 at 05:10 PM. Thank you donna13350 for the needle threader cite, I ordered one. I do appreciate your help. You're welcome! They are nice to have..especially for older eyes lol.I don't know if they come with directions for lining them up or not, but if you need help, holler, and I'll walk you through it. I have one -- actually, two now -- like this without the guide. I ordered one from Amazon, realized I already had one in the feet that came with the Brother 450Q, and tried to send it back. Amazon told me not to bother, but gave me credit for it -- one thing I love about Amazon! But I've realized I don't like using that foot much, and prefer the divided acrylic foot. I just move the needle over to get 1/4 inch. Re: the problem you're having: Some good advice here, including checking the presser foot pressure settings. It may just be set for sheer fabrics and need to be adjusted.